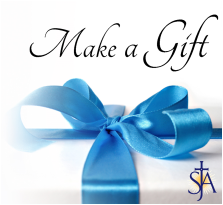 St. Joan of Arc Catholic Church is a 501(c) 3 non-profit organization recognized by the Internal Revenue Service. Donations may be tax deductible under Section 170 of the Internal Revenue Code. Online donations are convenient, quick and easy. Click here to donate online. If you prefer to send a donation by mail. Click here for a printable donation form and our address. We would love to chat with you. Call us to donate by check or credit card.